Merrivale Model Village01493 842097work Miniature villageOne of Great Yarmouth's best loved family attractions, set in over an acre of award-winning landscaped gardens with streams, waterfalls and lake with Koi Carp. Sit for a while, escape the hustle and bustle while you watch the Merrivale Railway go by and wonder at the models. Traditional crazy golf is also included in the admission price. The popular Old Penny Arcade is where you can hear the 'laughing sailor' and see 'what the butler saw', and not forgetting the Merrivale Tea Rooms, a favourite on the Golden Mile. Delicious food with diabetic, gluten-free and allergy free choices. First time for opening during February half term and with a special discounted price of £4.99 per person for all classes. SUGGESTED LENGTH OF VISIT: 1½ hours. Save up to £1.50. 50p off per person for up to 3 people paying the standard entrance price. Terms & conditions: Valid for 2019 season only. Not valid in conjunction with any other offer or promotion. Photocopies not accepted. One of Great Yarmouth's best loved family attractions, set in over an acre of award-winning landscaped gardens with streams, waterfalls and lake with Koi Carp. Take the A12 to Great Yarmouth. 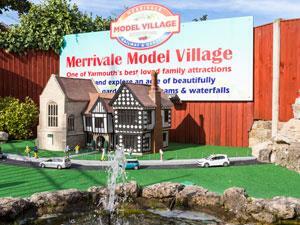 The Model Village is on Marine Parade next to Wellington Pier and Pleasure Beach Gardens.